A gift to the city from banker Samuel G. Murphy, the now sail-less windmill was the largest in the world when it was built. South, or Murphy, Windmill from a postcard image. 1910s?, 1910 - Courtesy of Dennis O'Rorke. A gift to the city from banker Samuel G. Murphy, the now-restored Murphy Windmill was the largest in the world when it was built. Able to pump 40,000 gallons of well water a day for park irrigation, its purpose was to save the city from the exorbitant costs that the private Spring Valley Water Company charged. 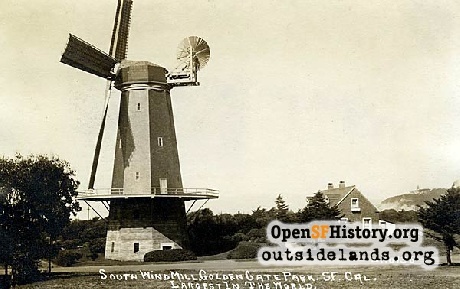 The Murphy Windmill, sometimes called the South Windmill, had a moment of fame when it appeared in a 1915 Charlie Chaplin movie, The Jitney Elopement. Electric pumps replaced the windmill's reason for existence fairly quickly. The structure fell into great disrepair in the decades after World War II, and may have spent more decades without its massive spars and sails than with them. 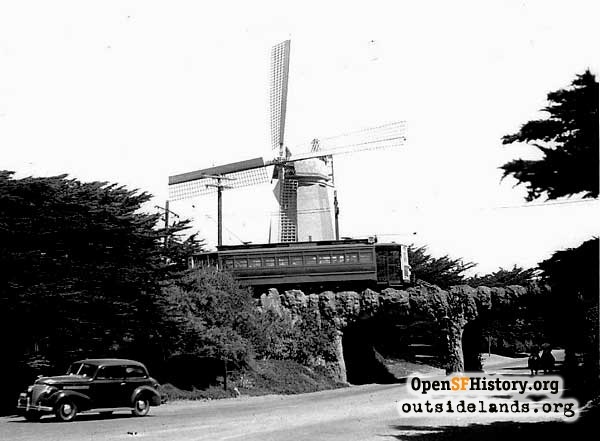 A long campaign to restore the Murphy Windmill ended in 2012, and today the blades can often been seen turning in the face of breezes from the Pacific. 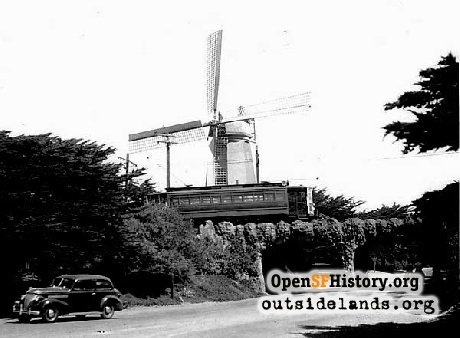 The Dutch windmill that had been built near Ocean Beach in 1902 was so popular with the Park Commission that they decided to build another one at the southwest corner of the park. Samuel G. Murphy, a local banker, came forward with $20,000 for the new mill. 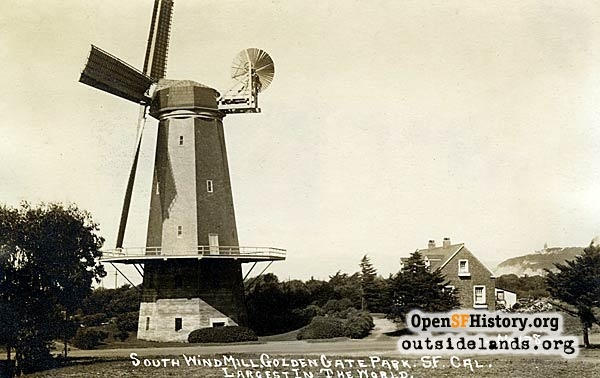 At a meeting of the Park Commission on June 7, 1907, the members voted to name the new windmill the 'Samuel G. Murphy Windmill,' and a local engineer by the name of Stutt was employed to prepare plans for the new mill at a fee of $300. On August 4, 1907, the plans were approved, and Superintendent McLaren was ordered to begin the construction at once. He was also instructed to estimate the cost of creating a lake that would serve as an irrigation reservoir when the new windmill was built. When McLaren reported that the lake could be built for $9,513, the commissioners ordered that the work be done as soon as the weather permitted. Not until April 11, 1908, were the windmill and reservoir completed. On that day Mayor Taylor and his wife, John McLaren and the park commissioners gathered to see the new windmill turn its sails for the first time. The structure pumped from the wells beneath it to the new lake a mile away on Middle Drive. In keeping with ongoing political practice, the lake was named after the president of the commission and became Metson Lake. 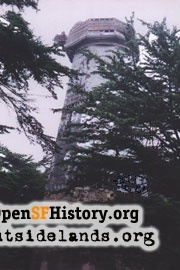 According to the [San Francisco] Examiner, the windmill had cost $22,000. The Pacific Lumber Company donated the two spars for the windmill. These spars were 2 feet square at the hub and 8 inches square at the tip. They were 114 feet long, and each was cut from a single log. W.J. Dingee, the former commissioner, donated 1,500 tons of concrete for the mill and Louis Sloss donated the copper dome. The Dutch Windmill, built in 1902, had been covered with cedar shingles, but the Murphy Mill was covered with slate shingles. It is interesting to note that former Commissioner W.J. Dingee owned or controlled most of the slate mines in California. Superintendent (Julius) Girod reported in October  that one of the spars of the Murphy Windmill was in such a state of dry rot it was in danger of falling. If it fell, it would probably destroy the entire structure. He estimated that the removal would cost $800, and the board decided to petition the mayor for monies from the emergency fund to remove the spar. The following month, the mayor approved the request. A contract was awarded to J. Philip Murphy Company to do the work on the Murphy Windmill for $750. Page launched 11 September 2001; Updated 11 October 2013.